As the darker days of autumn set in, a wonderful way to embrace the changing season is to surround yourself with the warm intimate tones of the Brahms Trio in A Minor played by clarinetist Joseph Orlowski, cellist Mary Katherine Finch and pianist Ron Greidanus. This melodic programme will also feature music of Bruch and Scriabin and will be followed by a delicious spread of delicacies. We are a renowned Chorale ensemble with approximately 20 voices specializing in Baroque repertoire from the likes of Vivaldi, Charpentier, Handel, and of course J.S. Bach. 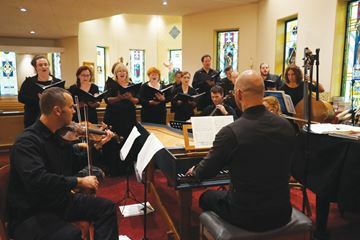 The GBC performs in a variety of spectacular venues in Halton Hills, from the intimate setting of a private home to the stunning beauty of local churches like St. Elias Ukrainian and the Croatian Centre. Tickets can be purchased at Foodstuffs in Downtown Georgetown, 905-877-6569; Pat’s Meats and Deli in Georgetown South or at the Holland Shop in Acton. They can also be purchased online at www.georgetownbachchorale.com. For more information, please call 905-873-9909.